Dr. Mariot Simon, Vice President, fittingly brought to memory the Chinese proverb, “the journey of a thousand miles starts with the first step” at the Launch of UB’s Accreditation Initiative. As part of its Transformational Plan the University of Belize will be seeking accreditation by the year 2022. A launch was held on May 7, 2018 where Board Members, Senior Managers, Directors, Deans, Chairs and representatives of students, faculty and staff were present. Professor Emeritus Clement Sankat encouraged the participants to seize the opportunity to take this University forward. “Its attainment will not only enhance our respectability in this national, regional and global community of Universities in which we operate, but most importantly the mobility and transfer of credits of our graduates – to graduate school for example; the employability of our graduates and the potential of our graduates for enhanced financial support; the licensing process for graduates from our professional programs and very importantly our ability to attract prospective students not only from Belize, but from the Caribbean and Central America and the world over,” expounded President Sankat. Mr. Deryck Satchwell, member of the Board of Trustees, encouraged the UB team to not see accreditation as meeting a checklist of standards but developing a culture of quality. Chairman of the Board of Trustees Mr. Harrison Pilgrim congratulated the leadership team of the University for their hard work in advancing the University and assured those present of the support from the Board. The Chairman and the President congratulated the Faculty of Nursing, Allied Health and Social Work on the news that it’s Bachelor in Social Work program meets the standards for its students to move seamlessly into US Universities to pursue their Master Degree in Social Work. 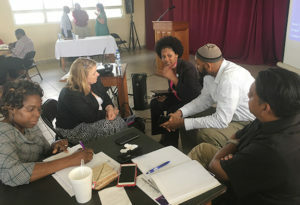 The accreditation launch was facilitated by Dr. Carlise Wynne, Professor at the University of North Georgia (UNG) and Dr. Chaudron Gille, Associate Provost, UNG. They presented on the value of accreditation, the types of accreditation and the different regional and international accrediting bodies. They then went over the standards including candidacy, documentation and quality assurance and requirements. In the afternoon Faculty and Staff formed workgroups and brainstormed on the seven principal pillars on which the accreditation decision will be based. There was also a group that was principally focused on the Marketing and Communication to support this accreditation drive. During the presentations the ideas and enthusiasm were very evident. President Sankat thanked Dr. Wynne and Dr. Gille for sharing their knowledge and experience with UB especially since it was in a voluntary manner. He also encouraged the UB team to continue with the enthusiasm and drive in developing quality at UB. 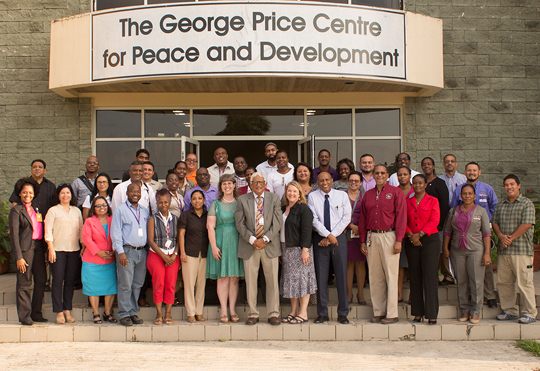 The participants at the workshop unanimously agreed that UB should pursue accreditation. The University of Belize will be following up on this with the Southern Association of Colleges and Schools Commission on Colleges (SACSCOC). This will be a process where all will be further engaged. The World Water Day (WWD) 2018 Planning Committee in Belize conducted roaming presentations to some primary and secondary schools across the country. UB-FST, a partner in the WWD 2018 Planning Committee; participated in these roaming presentations visiting six schools, including two high schools and four primary schools in the Corozal, Stann Creek, Toledo districts and the City of Belmopan. The Bachelor in Natural Resource Management students in the Watershed Ecology & Management Course did oral presentations and class activities on the importance of water and description of selected watersheds in Belize. 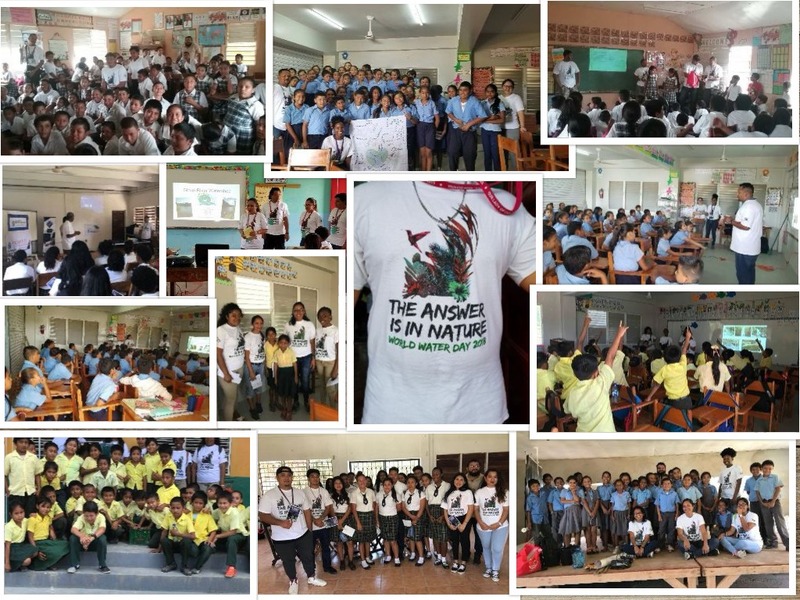 The presentations focused on this year’s World Water Day 2018 Theme, “Nature for Water: The answer is in Nature.” The school visits took place from April 21-23, 2018. The presentations were coordinated by Mr. Josue Ake from Faculty of Science and Technology. 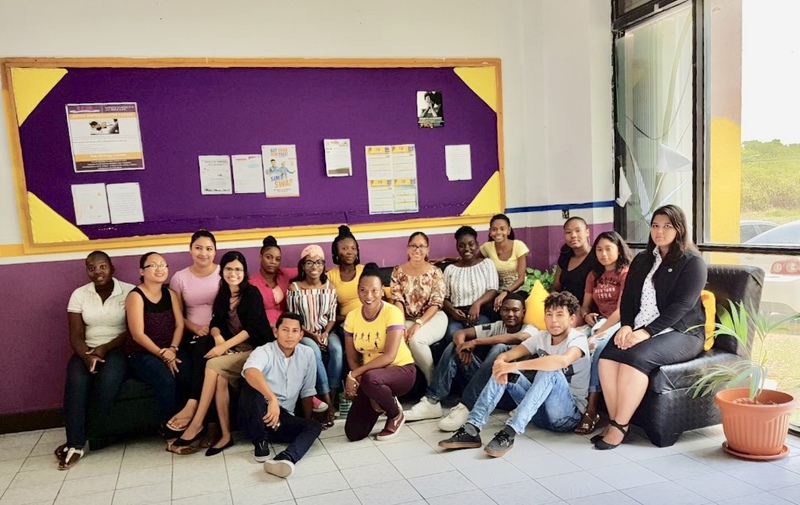 Every year the Introduction to Tourism Marketing Class guided by their lecturer Ms. Eda Chang-Arzu takes on initiatives to beautify the Faculty of Management and Social Sciences site in Belize City so as to make it more welcoming for everyone. This year was no different and at the beginning of the semester the class decided to embark on a project to enhance the lobby area of the Faculty, as partial fulfilment of this course. The lobby now has a Smart TV to share information regarding current and upcoming events, four security cameras to ensure safety of students, faculty and staff as well as of the equipment. The students also created a beautiful and comfortable seating arrangement that brings a “home-like” feeling to the workplace. The Introduction to Tourism Marketing course entails the need to incorporate business consciousness, sustainable and project development. The students developed their knowledge and skills in these areas and they all shared the sentiment that “hard work pays off” which they are very proud to be a part of. Initiatives as this, are sure to mould, foster ownership and leadership in our students. Ms. Eda Arzu thanks Dr. Bernard Watler, Dr. Jean Perriott, Mr. Francis Burns and Mr. Javier Rosado for supporting the students. The President on hearing of this project indicated his pleasure at this transformation that is occurring at the Faculty of Management and Social Sciences and congratulated Ms. Eda Arzu and her students. He further indicated that this should be best practice in all our Faculties. H.E. Oliver Del Cid, Ambassador of Belize to Mexico, engaged the President, Vice President and Acting Director of the Regional Language Center (RLC) Mr. Noe Agreda and indicated the need for the RLC to develop professional courses, some of a short, intensive nature to train Spanish speakers in the English Language. He indicated, from his experience in Mexico City, the demand is there and urged the RLC to move in this direction. Mr. Agreda indicated that he was already working on this matter and shared some proposals with those present at the meeting. It was agreed that these programs should be marketed via the social media and H.E. Del Cid promised to do his part in this. 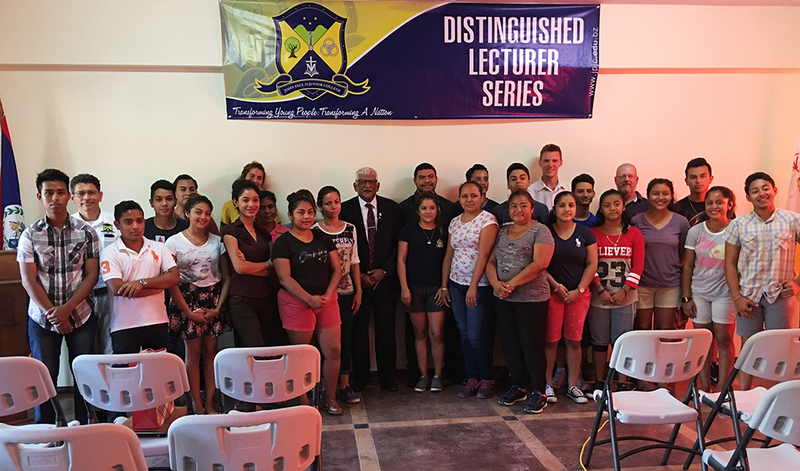 Professor Sankat was invited by the leadership of John Paul II Junior College in Benque to deliver a Distinguished Lecture on May 2, 2018 to Faculty and students of the Junior College. The President spoke on “My Journey of Leadership and Service: Innovating, Transforming, Reflecting and Learning” and this was well received by the audience. The President complimented John Paul II on its lovely, distinctive infrastructure and location in Benque. Professor Emeritus Clement Sankat along with Dr. Mariot Simon met with Fulbright Scholar Dr. Carla Fry and representatives of the US Embassy. 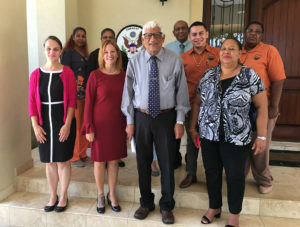 Dr. Fry concluded her program at the Faculty of Nursing, Allied Health and Social Work, University of Belize and made a presentation on her proposals for revamping the nursing curriculum with more emphasis on nursing practice. Dr. Fry also agreed to continue to assist the University of Belize in developing its nursing programs even at the graduate level. The Faculty of Science and Technology (FST) is expanding in student numbers and programs; the President, at the request of Dean Ms. Julianne Pasos, saw fit to acquire a wooden building to support the expansion. The Chemistry Laboratory is being expanded to house both laboratory and offices for the Faculty and Staff. This work is expected to be completed in time for the new academic year. President Sankat complimented Mr. Francis Burns and his staff for the steady work they are doing on this project. 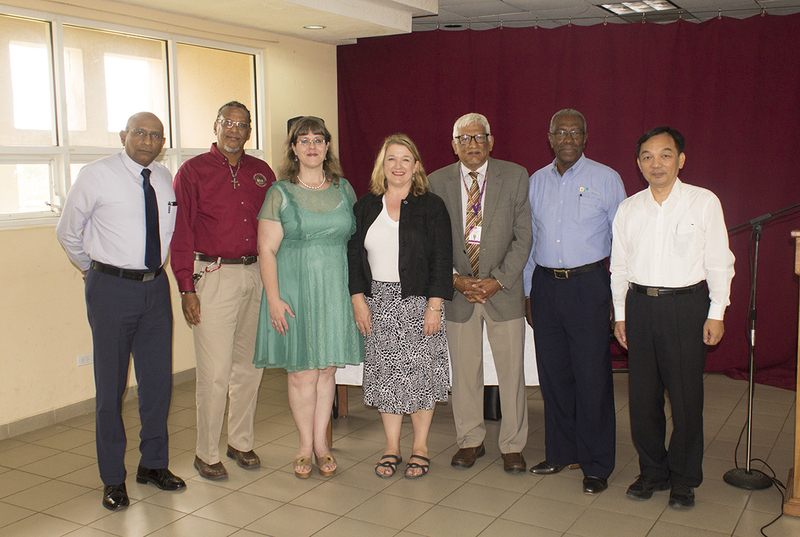 The President also congratulated Dean of the Faculty of Education and Arts (FEA) Dr. Nestor Chan and Assistant Professor Dr. Priscilla Brown-Lopez on a very successful stakeholder meeting with potential students for the proposed Master’s Degree in Educational Leadership (MEDL). The MEDL is scheduled to be finally approved by the Board of Trustees and commence very soon. 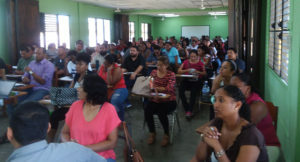 The meeting was held on May 5, 2018 at the FEA Campus in Belize City and the room was filled to capacity. This is a very good signal with respect to the future success of this program. The President, was on Krem TV, and Radio Morning Show “Wake Up Belize” on May 2, 2018. 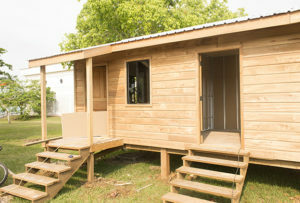 He was there specifically to speak on the Transformational Plan, on how it is progressing at the University of Belize. He was interviewed by Mr. Mose Hyde, who suggested to the President that more time was needed for an extensive interview both with Professor Sankat and the leaders of the University. Professor Emeritus Clement Sankat has been making regular rounds to Central Farm Campus as the transition has to occur to treat with the retirement of Campus Administrator, Dr. Gordon Holder. 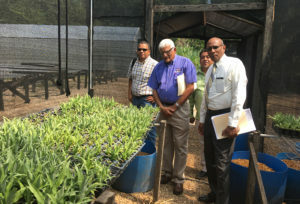 Further, he is also reviewing the progress of the EU Banana Belt project which is a very important initiative for the Central Farm Campus, the University and Belize’s Agriculture. 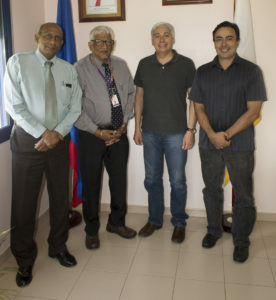 Professor Sankat was accompanied by Vice President Dr. Mariot Simon and Dr. Dion Daniels from the Faculty of Science and Technology. It is clear that much work is required at the Central Farm Campus as it prepares for a new intake of students in August 2018. 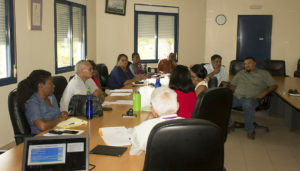 The leaders of the Environmental Research Institute (ERI) met with the University’s Senior Management to review the current business model of the Calabash Caye Field Station (CCFS) operations, with a view to making the necessary changes, so as to make this operation sustainable. All agreed that the CCFS was an important living laboratory for the current Natural Resource Management program and also the new Bachelor’s program in Marine Biology that will be launched very soon. President Sankat commended the ERI team on the proposals they presented and their approach to the initiative.